The state of California is suing the federal government over persistent cross-border renegade sewage flows in the Tijuana River Valley. California Attorney General Xavier Becerra and San Diego’s Regional Water Quality Control Board contend the federal government has repeatedly violated the Clean Water Act. The lawsuit says federal officials have failed to collect and divert contaminated renegade flows that ended up fouling U.S. waters. The federally owned sewage plant near the border has continually violated its discharge permits, according to Regional Board executive officer David Gibson. Gibson said the federal government can’t be fined. So the state is seeking improvements that will stop the contaminated flows. “That includes intercepting and diverting those flows, monitoring them when they can’t do so and ensuring that the public is adequately informed and has a clean-up plan that they can count on,” Gibson said. The International Boundary and Water Commission's sewage treatment plant near the U.S.-Mexico border has a discharge permit that acknowledges that the plant and nearby sewage collectors lack the capacity to deal with wet weather flows. However, the lawsuit says the federal government routinely violated its pollution discharge permit during dry weather conditions. “Those flows can be captured and diverted during the dry season and on several occasions, the IBWC failed to intercept those flows and then failed to do monitoring or clean-up actions to address those flows,” Gibson said. The state’s legal challenge was widely expected. The attorney general filed an intent to sue two months ago. 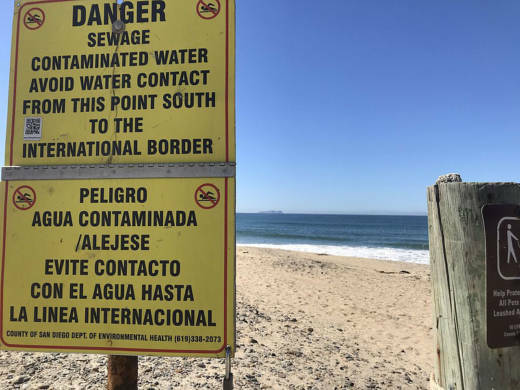 Imperial Beach, Chula Vista and the Port of San Diego already sued the federal government to stop cross-border sewage flows. The Surfrider Foundation has also notified the federal government that it plans to sue because of the persistent pollution of ocean waters.